I thought about it and yes we were. We were playing catch while people rode bikes, pushed strollers and ran dogs. One man living out of his van even lay out on the grass enjoying the sun and offering coaching tips for me and my son. And the park we were reclaiming? 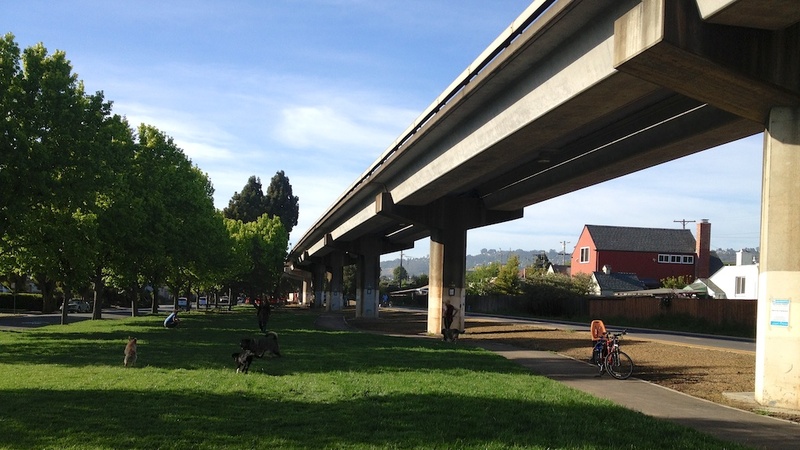 A strip of grass under the BART tracks. The whole place has been fenced off for the better part of 18 months while the elevated tracks were retrofitted to make them a little more secure in an earthquake. A few weeks ago what was now grass was a barren patch of earth that had been dug and raked and prodded and poked and fenced off. It made me realize that it doesn’t make much to make a park — its all about the attitude you bring. Previous PostNine tips for backpacking with a five year oldNext PostGreen Design: White Elephant?